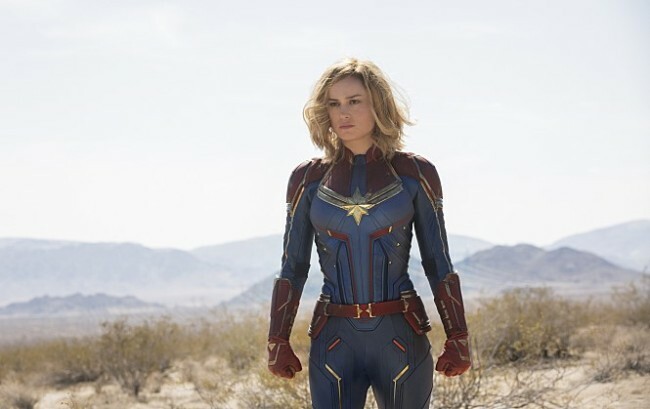 Hearing all the talk about “Captain Marvel” prior to its release, I was concerned about one thing: Would this film, which depicts the power of women, be so hung up on being a politically correct “feminist film” that it would forget to be an actual film? My concern was unwarranted, as the Marvel Cinematic Universe’s latest movie not only delivered a relevant message, but was also fun to watch. While it did have some shortcomings, the film lived up to the standards the audience has come to expect from MCU films. The movie starts with Vers, played by Bree Larson, waking up to a dream about a past that she does not recall. A warrior from a powerful alien race called the Kree, she struggles to control her emotions and powers as her commander Yon-Rogg -- Jude Law -- guides her. When Yon-Rogg’s team is dispatched on a rescue mission, Vers is kidnapped by the Skrull, a race of shape-shifters who are at war with the Kree and are now searching for something to which Vers’ memory holds a clue. After a narrow escape, she lands on Earth to find the life she’s missed out on, along with her true identity as Carol Danvers. Danvers is joined by agent Nick Fury -- Samuel L. Jackson -- of the intelligence agency S.H.I.E.L.D. on her quest for answers about her past, about a mysterious woman who keeps visiting her in dreams, and about the truth behind everything she has ever known. “Decent” is the word that best describes the film. It was funny and it had action, good acting and nice special effects, but I do not think the flick will be the one that makes the careers of directors Anna Boden and Ryan Fleck take off. I loved the film’s take on strength and what it means to be human. When Kevin Feige said Captain Marvel will be the “strongest character in the MCU,” I hoped that did not just mean physical strength and the film delivered on that hope. Played by the talented Larson, Danvers is a strong character in every sense of the word. The movie took the vulnerability of being “only human” -- which seems more profound in a movie universe filled with powerful aliens -- and showed us the power of resilience. The film was also clever enough to work in some strong feminist themes without overdoing it. My favorite line in the movie was Danvers saying “I don’t have to prove anything to you,” which has a nice ring to it in a world filled with misogynistic trolls who bombed the film with bad reviews even before its release. The twist with the good guys and the bad guys, intentionally or not, made me face my own prejudices about people’s appearances and their inclinations. As a child of the 1990s, the ’90s reference made me delightfully nostalgic. From the looks to the music, the way they talked and the Fresh Prince, it was so ’90s that I couldn’t stop smiling. The respects the film paid to the late, great Stan Lee were expected, but I liked that part anyway. Larson had no trouble portraying strength and heart and there were no glaring weak links in the cast. The ones who really stood out were Nick Fury and Ben Mendelsohn as Talos -- both were funny and charming. I had mixed feelings about the action, though. The CGI battles had both kickass moments and “Green Lantern” moments, and the hand-to-hand combat was not memorable. Marvel did give us the Russo Brothers and while I did not expect “Captain America: The Winter Soldier” quality, it was underwhelming for such a strong character. The film did not overplay the feminist theme, but certain moments were too on the nose. Larson is one of the best young acting talents Hollywood has to offer, and sometimes it’s better to let the acting say something rather than spell it out in dialogue. By far the biggest problem I had was with the characters -- ironically, also the MCU’s biggest strength. Let’s start with the villain. Watching phase three of MCU, I thought Marvel Studios had finally learned how to make quality villains. Discussing the villain in depth runs the risk of a spoiler, but that character is dull in every way. Also “Captain Marvel” has possibly the weakest supporting characters among the recent MCU films. Maria Rambeau, Dr. Lawson, Korath and the rest of the interchangeable Kree team are all forgettable. The only good side characters are Fury, Talos, Goose the cat and maybe Clark Gregg as Phil Coulson, who had very little screen time. But Coulson and Fury benefit from having already been developed as characters in the MCU. The main character, Carol Danvers, was the biggest letdown. Larson’s performance was solid, but the role was written with scarcely any character traits besides being a strong, unrelenting woman with her heart in the right place. Simply put, she is too perfect and being too perfect can spell trouble in the movie universe. People didn’t love Tony Stark as Iron Man because he was perfect. They loved him because he had flaws. Behind his armor and his massive wealth, he was a scared little kid looking to do the right thing. This is what made his chemistry with Pepper Potts and other side characters, who, on their own, would’ve been boring, so great: They needed each other because of their weaknesses, making them relatable to fans. “Black Panther” was another film that had similar problems with its hero, but it benefited from an interesting set-up, a memorable supporting cast and -- in my opinion -- the best MCU villain other than Thanos. The chemistry between them was fantastic, and it had one of the most outstanding protagonist-antagonist relationships in the MCU. The chemistry is weak in “Captain Marvel.” Danvers’ interaction with Fury and Talos isn’t bad, but this is mostly because these two are such charming characters. The power of acting allows Danvers to have some legitimate moments, but it never felt like there was a strong bond. The best chemistry actually consisted of a few moments between Fury and Talos, and between Fury and Goose the cat, who stole every scene. But keep in mind that this is Carol Danvers’ first time on the big screen. While some -- like Iron Man, Ant-Man and members of the Guardians of the Galaxy -- have an immediate impact, others take time to win our affection. Who got by far the biggest cheer in “Avengers: Infinity War”? Thor. Yet, who was the dullest avenger for his first four outings in the MCU? You guessed it. Despite its flaws, the film is a decent superhero flick, and has the potential to take off to new heights with more character development. It has wit, action, both over-the-top and down-to-earth moments, and a ridiculously strong CGI character beating up generic villains to some damn good music. In short, it’s a Marvel film, and a pretty good one at that.